The Friends of the Palm Springs Animal Shelter Annual Faux Fur Ball V was held on April 6 at the Palm Springs Air Museum. This year’s original Tiki theme ‘” Island Tails “ event attracted over 500 guests. As guests entered the Museum Tiki inspired dancers and song prevailed setting the stage for a spectacular fundraiser. 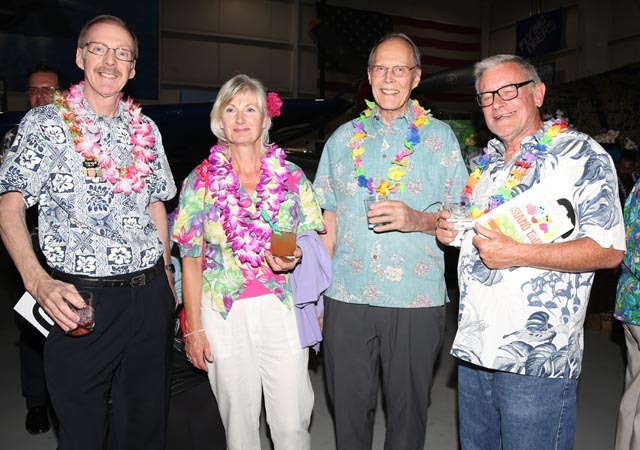 After the Silent Auction, an international buffet dinner was served in the Museum’s Hangar. Guests could select from Latin, American and Asian vegetarian specialties displayed buffet style. In other words, a slider revealed a perfectly placed round mushroom! The Friends focus on “responsible pet stewardship and the humane treatment of animals”. This year’s Humane Hero Award was presented to Hugh Donaldson, a life long “lover of animals” whose generosity has resulted in an impressive impact on the lives of shelter animals. The Champion for Animals Award was presented to Dr. Douglas Kunz, a founder of the Animal Emergency Clinic of the Desert and founding President of the Friends of the Palm Springs Animal Shelter from 1996 to 2015. 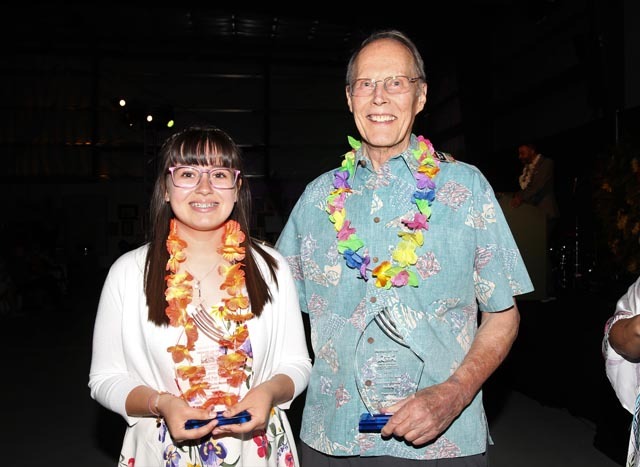 The Young Hero to Animals Award was presented to Nelly Valencia Carbaja, a fifteen-year-old Palm Desert High School Student. Her mother, Ana accompanies her when she volunteers at the Shelter. This trio of honorees exemplifies the impact The Friends has on saving the lives of our pet community. Among the life-saving solutions, the Shelter provides their low-cost public vaccine clinics, the Fix-a-Friend low-cost spay, and neuter mobile clinic and humane education; all focused on honoring responsible pet stewardship. During 2018, a ‘banner year’the Friends fostered 778 animals providing 51,652 hours of care, 5,005 vaccinations and 3,853 pets spayed and neutered. The thanks go to 16, 903 volunteers providing 116,903 of donated hours. Adding to the success of the Friend’s event were this year’s sponsors. 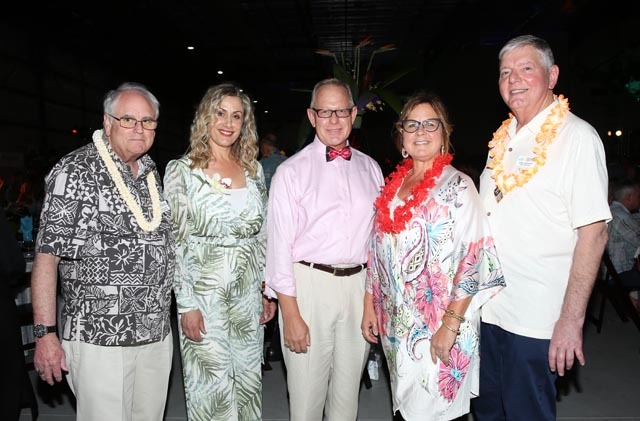 The Big Kahuna Sponsor was PetCo Foundation and the True Hoal’olu sponsor, Carl Johnson and Larry Seeger. Bryan Gallo, NBC Palm Springs served as emcee, joined by Benefit Auctioneer, Karen Sorbo. The Friends also announced their 2020 project, Crossroads Oasis Memorial Garden, a “peaceful, serene space designed to allow all those who enter a place to honor and remember our beloved pets. Contact Judi Olivas, Development Director at jolivas@psanimalshelter.org or call ( 760 ) 416-5718 for details.